The death of my younger brother left me with a lot of confusion. He was gone but I could still feel his presence. After a period of intense mourning, I decided to find out what happened to him after he died. To console me, my uncle had given me a very interesting book: “The Autobiography Of A Yogi” by Paramahansa Yogananda. In this book, I found some answers and I learned about the deathless saint Babaji who lives in the Himalayas. From that moment on I became obsessed with the idea of meeting Babaji and tried to find as much information as possible about him. When I found a book about Haidakhan Baba, I was so thrilled because it seemed like my prayers had been answered. I was going to meet Haidakhan Baba who claimed to be a manifestation of Babaji! I became disillusioned and heartbroken however to read at the end of the book that he had gone into Mahasamadhi in 1984. I found some videos of Haidakhan Baba on youtube and watched them over and over again. I kept looking and trying to find his successor or at least a true Guru. One day in October 2010, I found a link to ‘Buddha Boy’ and the more I learned about Him the more I got the feeling that He might be my true Guru. I decided to write to the BSDS organisation and volunteer to help paint the Dharma Hall that was under construction. I never expected an answer but to my surprise I received an email back! One month later, I was on my way to Nepal to find my future Guru who was still meditating under the holy Pipal tree in Halkhoria jungle. Never in my life had I been so scared and excited at the same time. Traveling by bus from Kathmandu to the Terrai over the mountains was a breathtaking adventure. The thought of meeting this great Guru made me determined to keep going – this was priority number one in my life! Fortunately, I recognised Andrea Good from one of the ‘Buddha Boy’ documentaries on YouTube. 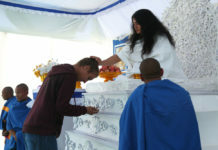 She welcomed me with open arms and explained that all these monks had gathered here to receive teachings from Guru. There were only a few foreigners who had found their way to this place and fortunately for them, they had become disciples of Guru the day before. They told me how the rituals were performed and also that this was a wish fulfilling place. I didn’t know what to think of all this but it wouldn’t do any harm to make a wish. Hmm, I had to be careful what I would wish for considering the consequences. It was difficult to wish for something of which I could also quickly see the result. After contemplating on what was ‘best’, I could only come up with the wish that Guru would grant me an opportunity to become His disciple within the week I had left. 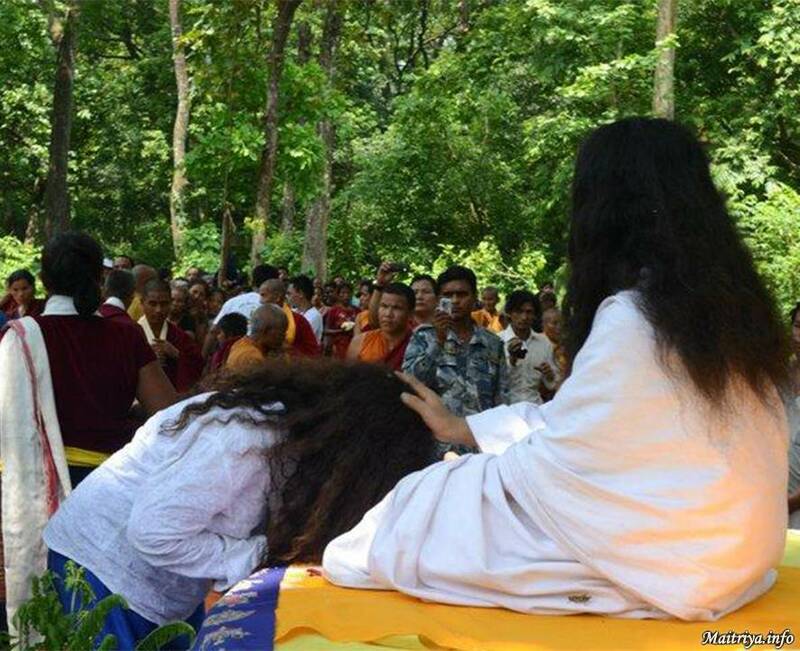 I believed the chances were zero within such a short period however the next morning, Andrea woke me up at 5am to see Guru meditating under the holy tree. We had to walk barefoot on a small path into the jungle and after a long 15 minute walk, we arrived at the huge holy Banyan tree where, seated on an ‘asan’ made of cement, was this young meditator – motionless. It was unreal, as if I was watching him on the internet. Nothing happened to me and I wasn’t going to pretend that I felt anything. The next morning however we went again and this time ‘Buddha Boy’ looked at me. Not immediately, but after a few hours I felt a happiness that I had never experienced before. It was as if even the trees were singing – the whole place was vibrating with pure love. My heart was jumping up with joy and then Andrea came to ask me if I wanted to become Guru’s disciple. My wish would come true! It was as if I had stepped into a fairy tale and 5 years later it still feels like that. Maha Sambodhi Dharma Sangha’s unconditional love will lead us to Mukti and Moksha if we follow Him. I’m convinced of that!